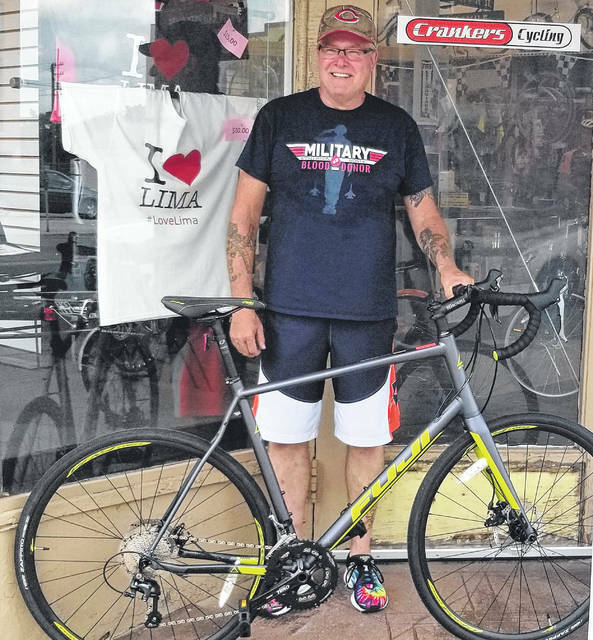 Michael Manger, of Anna, will be riding his bicycle 100 miles on Saturday, Sept. 1, to raise money to help families whose children are battling cancer. The ride starts at 6 a.m. at Anna Elementary School and he will return to the Anna American Legion between 4-5 p.m.
ANNA — Michael Manger, of Anna, will soon be cycling 100 miles in order to raise awareness for childhood cancer, and to find sponsors and donors to help all the affected families in Ohio. Manger opened The Angels of Childhood Cancer Foundation on Jan. 1, 2017. His passion for fighting cancer dates back to 2011, when Manger met a young teenager suffering from Osteosarcoma (bone cancer). They developed a friendship based on their shared compassion for those afflicted with cancer, especially children, with Manger learning that less than 4 percent of government cancer research funding is used for the study of pediatric cancer. After her death, he devoted himself to the cause and began raising money for CureSearch, a nonprofit that researches childhood cancer. This was his group’s main focus until 2016. It was then they became more aware of how cancer affects families financially, through the costs of traveling to hospitals (gas, food, hotel stays, etc.) in addition to the hospital bills themselves. Manger said they prayed about this new information and felt that they were being called to start financially supporting families in Ohio. The Foundation’s present goal is to raise enough awareness, find enough sponsors, and receive enough donations to financially support every family affected by childhood cancer in all 88 counties of Ohio, as well as Ohio’s Children’s Hospitals. This year’s Shelby County fundraising event will take place on Sept. 1. It will begin at the Anna Elementary School at 6 a.m., where Manger will start his 100-mile ride. He is aiming to finish around 4 or 5 p.m. at the Anna American Legion, where the rest of the fundraising festivities will take place. There will be food and drinks, music, and inflatables at the school while Manger is cycling through the county. Not only will donating help families financially and fund cancer research, but 50 percent of the money raised at this event will be donated directly to the family of Henry Springer. Henry, son of Matt and Emily Springer, is just 2 years old and is currently battling brain cancer. Visit the Facebook page to view a map of the route and join Manger in cycling or cheer him on. To make a donation or become a sponsor, contact Michael Manger at accf467@gmail.com or send a message on the event’s Facebook page.